Cook a full menu better, faster and easier. 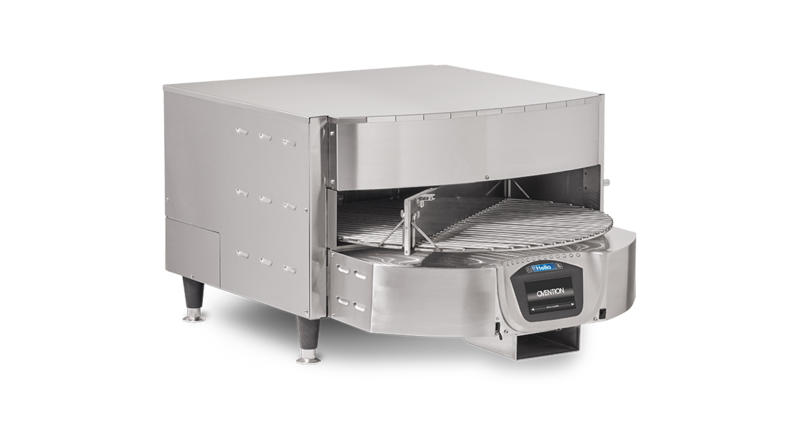 The Ovention Matchbox M360 has Precision Impingement® technology, a unique cooking carousel and a small footprint, making it the perfect fit for any operation. The Matchbox M360 features the latest technology for a one-of-a-kind cooking experience that’s great for high volume. Using proprietary Precision Impingement technology, the M360 allows you to control time, temperature and independent blower speeds for every item you cook. With up to 600 pre-programmed cook settings, you can stage the entire process for superior quality. The Matchbox oven saves you time, energy, and money- not only in cook time and electricity, but also in labor. The Matchbox uses a proprietary technology called Auto Load and Unload. This moves the cooking surface into the cavity at the touch of a button, beginning the cook cycle. Once the cook cycle has completed, the cook surface will automatically exit the cavity. This saves multiple steps compared to a manual load oven, monopolizing less of your staff’s time and making it simple. That’s right- Auto Load and Unload also means no more running to the oven to open the door just to reveal burned, wasted food. With precise cook settings and automatic loading and unloading, food is consistent and your operators are free to multitask without risk of compromising the food. Customers are happy that their food is cooked perfectly the first time, and you are happier that you aren’t throwing burned inventory into the trash. FlexTemp lets you increase or decrease temperature by 25°F from one item to the next. And an intuitive one-touch display loads and unloads two cooking surfaces at the tap of a touchpad to prevent overcooking. The closed cavity holds moisture and maintains food integrity, along with a 30% higher yield. It’s also one-third more energy efficient than traditional countertop conveyors, with less heat produced in the kitchen. The M360 is uniquely suited for middle-of-the-house and open kitchen concepts. The rotating carousel reveals the finished food with flare, providing a unique theatre that your customers will love. An array of decorative facades are also available- from brick oven designs to completely custom-branded designs, we’ll help make your oven even more attractive. It’s also certified for ventless operation, so you can install it anywhere without a ventilation hood over it.